CCS: If we can capture the CO2 affordably, do we have to store it on the moon? Since 2007 Canadian startup Inventys Thermal Technologies has been developing carbon capture technology based upon a new honeycomb activated charcoal adsorbent. They claim their “VeloxoTherm™ process is less than one-third the cost of existing post-combustion CO2 capture technologies and will finally enable the widespread adoption of enhanced oil recovery and carbon sequestration.” That’s USD $15 per tonne – but doesn’t include any of the cost of transport and storage to implement CCS (or enhanced recovery, the primary current market for CO2). Existing pilot scale carbon capture from flue gas installations are expensive and energy intensive, with industrial scale installations expected to add 40 to 50% to LCOE of coal-based electricity. Ucilia Wang‘s article describes recent Series B round financing that I read as indicative they may be on to something that could be close enough to affordable to get some adoption. Chevron Technology Ventures joined the B round for an undisclosed amount. Steven Chu, former US Energy Secretary, joined the board in Dec 2013. That’s another indicator that there is something here. Given a carbon price of $25/tonne CO2, let’s hope that this process proves to be scaleable and “affordable”. But where will utilities be allowed to store the captured CO2? Nuclear waste is produced in very small athletic-field scale volumes, and is safe to store in available geological formations – as well as perfectly safe to manage in dry cask storage at central repositories (think stadium-sized parking lots). I would be happy to have either one in my neighborhood. But to be useful as a GHG emissions strategy, CO2 storage involves volumes that are so large that the public is going to have real trouble grasping the scale. Unlike nuclear waste, there is comparatively larger risk of future CO2 leaks. Radioisotopes decay back to the level of the original rocks, only about 300 years for 4th generation nuclear waste. This CO2 needs to be “imprisoned” forever. Will the NIMBYs and BANANAs ever allow these giant CO2 repositories on Earth? Or do we have to ship it to the Moon? A commercial scale British CCS Plant & CO2 pipeline? (…snip…) Energy and Climate Change Secretary Edward Davey opened the Drax coal-to-biomass conversion plant, and announced the Government was awarding funding to further the White Rose CCS project, also based at the site. 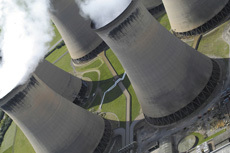 The multi-million pound FEED study funding will support the White Rose project, which is designing a c.£2 billion state-of-the-art coal power plant with full CCS (…snip…) It also includes the planned development of a CO2 transport and storage network – the Yorkshire Humber CCS Trunkline – which would have capacity for additional CCS projects in the area. Located on land adjacent to the existing Drax Power Station, near Selby in North Yorkshire, the proposed 426MW (gross) CCS power plant will burn coal with the added ability to co-fire sustainable biomass… 90% of all the CO2 produced by the plant will be captured and transported by pipeline for permanent storage deep beneath the North Sea seabed. The contract was awarded in September, but the planning process has to go through the Secretary of State to assess “nationally significant infrastructure”. I cannot find any estimates of cost or completion.